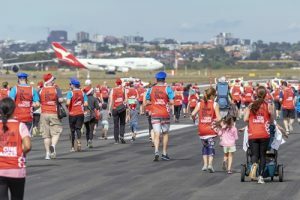 More than 250 members of the community have sprinted down one of Sydney Airport’s iconic runways to help raise money for life-saving cancer research. 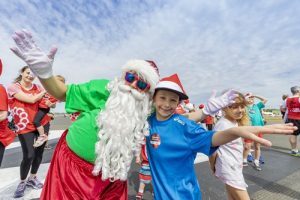 For the first time, the Runway Run was expanded to include a day of special entertainment, food and a host of other fun family activities – including a visit from Santa himself. The Family Fun Runway Run also officially kicked off this year’s Sydney Airport Community Christmas Giving Appeal. Over the next six weeks, the Appeal will raise both awareness and funds to support Cure Cancer and the nation’s brightest emerging researchers in their fight against cancer. Over the past six years, the campaign has raised more than $1.4 million for charity. Through the generosity of the airport community and travelling public, last year’s appeal funded a two-year research project into childhood cancer neuroblastoma. Sydney Airport CEO Geoff Culbert congratulated everyone who participated in today’s Runway Run and thanked the community for its continued generosity. Cure Cancer CEO Nikki Kinloch said: “We are delighted to be partnering with Sydney Airport for the Community Christmas Giving Appeal for the second year running. 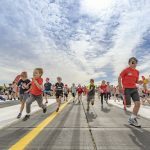 “Seeing our communities come together in support of Cure Cancer at today’s Runway Run was incredibly heartwarming, and we are very much looking forward to working together over the next six weeks at Terminals 1, 2 and 3. Over the course of the six-week Sydney Airport Community Christmas Giving Appeal, Cure Cancer will also be running a series of exciting activities at the airport, including a giant Santa Selfie Bauble in T1 and a Santa Selfie Booth in T2. These fun, family-friendly installations allow anyone to snap a selfie with the Cure Cancer Santa, which can then be shared across social media to spread a festive message of hope in the fight against cancer. The appeal also includes opportunities to donate in-terminal via coin-collection volunteers, Rotary bins and through Tap to Donate machines at participating retailers.